Children with Autism Spectrum Disorder (ASD) have varying levels of social skills and language abilities. Reading with your children is just as important for building communication skills in children with autism as it is with typical children. Use books that help meet your child’s goals and build skills by progressing upwards through books that build more advanced communication skills. First, start with books that help the child explore and pay attention. Then move to books that help children build conversational skills and understand emotions. For children who are not engaging with adults, the first step is to gain their attention. 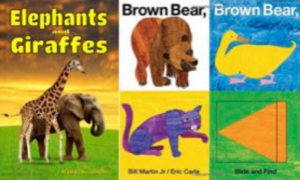 Books with realistic pictures of their favorite animals is a great way to introduce your child to books. Children also tend to connect with animals, and seeing pictures of them often sparks their curiosity, which is a key to getting them to start to engage. Examples would be Elephants and Giraffes and Pandas and Koalas by Francois Bissonnette. The best selling Touchy-Feely series by Fiona Watt are good books for children working on attention, because the textures are attractive and you can comment as your child explores the books. Also good for grabbing attention are pop-up books and the “slide and find” version of Brown Bear, Brown Bear by Eric Carle. The immensely popular children’s author Eric Carle is highly effective in engaging all children in reading and interactions. His books Brown Bear, Brown Bear and Chicka Chicka Boom Boom are big hits with many kids with autism. The Very Hungry Caterpillar is also fun. These books are repetitive – and learning these repetitive phrases is a way for your child to learn language. There are a number of children’s books that explicitly target social skills and emotions. The Incredible Flexible You (Volume 1) from Michelle Garcia Winner includes five books with titles such as Thinking with Your Eyes and The Group Plan. We also like When My Worries Get Too Big, which can help children understand their feelings. Socially Curious and Curiously Social is great for tweens and teens. Books by Mo Williams, such as Waiting is Not Easy, are also great.